As much as I love going on a hike, very few things can beat a FALL Ohio hike. No 98% humidity, fewer bugs, and the crunch of leaves underfoot. #Perfection. 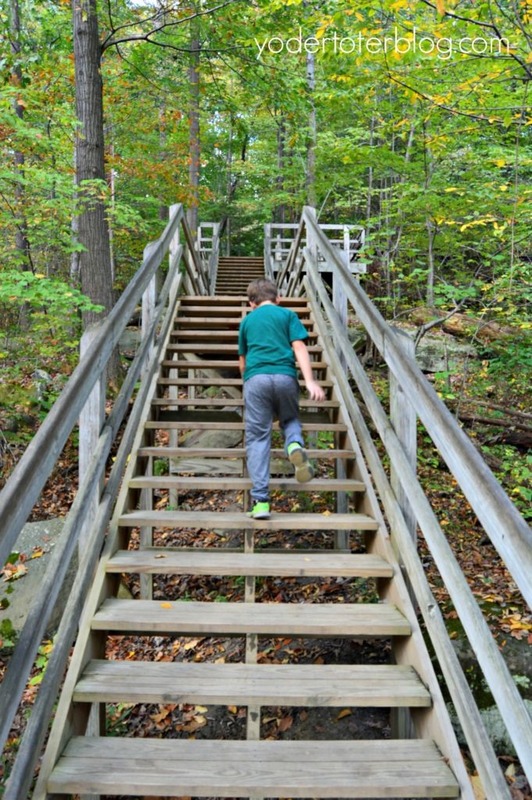 On our first trip to Summit Metro Parks, we were given the most glorious autumn day, and the history and scenery that we encountered did not disappoint. There are so many great hiking spots in Northeast Ohio, and Summit Metro Parks and this was definitely one not to miss. 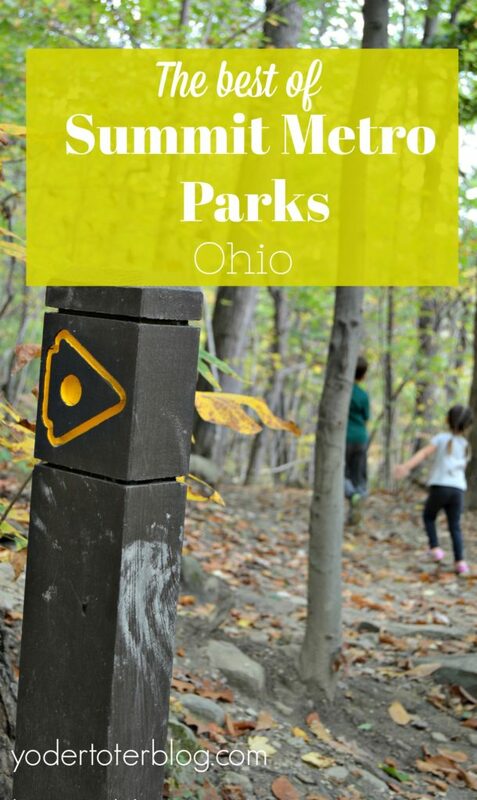 Our first stop in Summit Metro Parks was Gorge Metro Park (on my 2017 Travel Bucket List)! 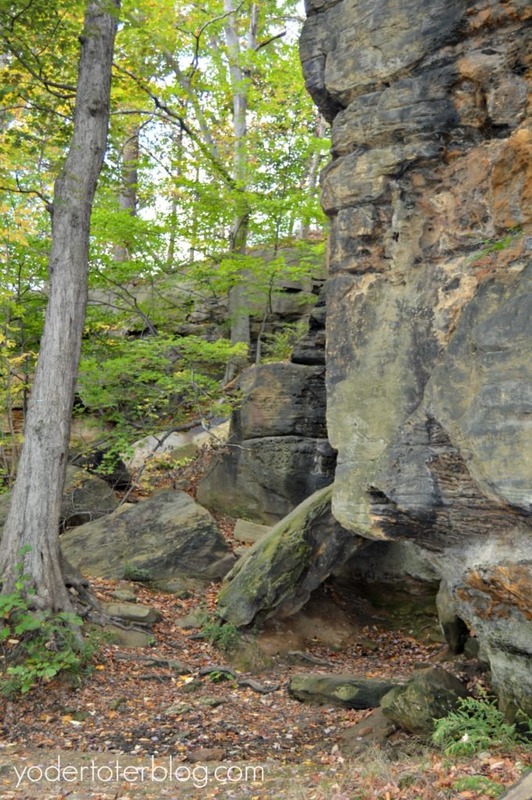 Gorge Metro Park is located in Cuyahoga Falls, OH and is an outstanding place to enjoy views of the Cuyahoga River, a large cave, and even do some fishing. 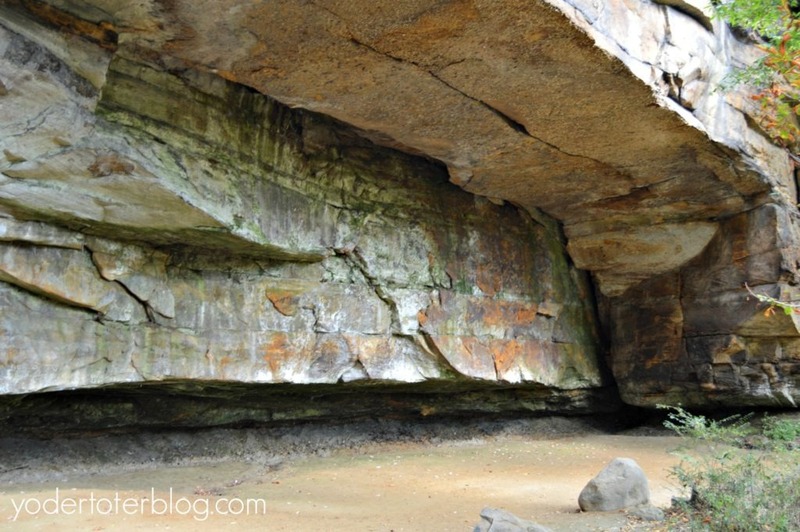 We ventured out on the Gorge Trail (aptly named) in hopes to see the Mary Campbell Cave. The cave is named after a 12-year-old Pennsylvania girl that was kidnapped from her home by the Delaware Indians. She was released 5 years later, in 1764, at the close of the French & Indian War. It is believed that she dwelt in the cave with the Native Americans! The history is fascinating, and the size of the cave is more than I expected. Unfortunately, the upper trail was closed past the cave, so we took the trail shortcut down to the Observation Deck. I could have sat here for hours and listened to the waterfall created by the Dam. Tourists have been flocking to this area since the late 1800s, at one time a small amusement park was adjoined! While the Observation Deck isn’t handicap accessible or stroller-friendly, shortly after this the Gorge Trail does become paved. 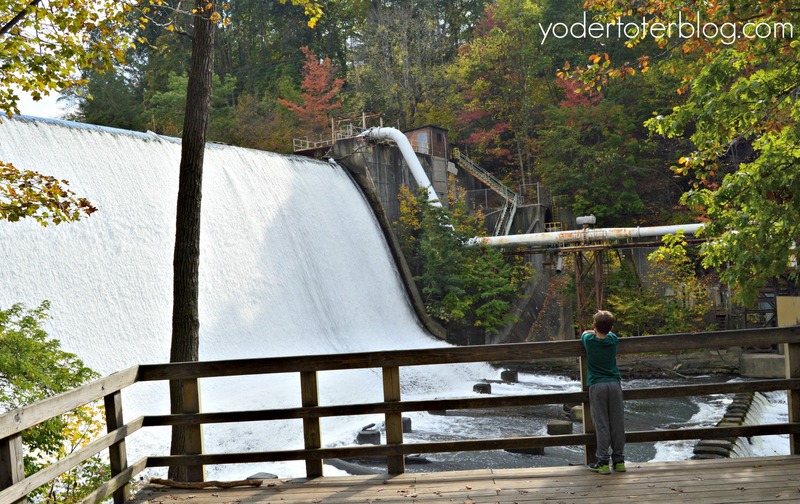 If you’re looking for a short trail to take unsteady feet, this would be a good one (See-> Best Ohio Hikes for Kids). The kiddos were getting a little antsy, so we headed back to the car for some snacks and scoped out our next stop within Summit Metro Parks. I’d read something briefly about an Indian Signal Tree and thought this would be a piece of homeschooling history that we could not miss! The Indian Signal Tree is located in the Chuckery area of Cascade Valley Metro Park. This bur oak is over 300 years old and was used by the Natives to find their way from the Cuyahoga River to Summit Lake. My mind wandered to the countless history that this tree has witnessed! I sat there in disbelief – that for most of my life I’ve lived less than 2-3 hours away and yet didn’t know this existed? This is why we choose to explore nearby areas and view local destinations as important as those that are hundreds or thousands of miles away! The Signal Tree is only about 100 yards from the closest parking spot, so this is an easy place to jump out and learn some history. There is an attached 2.4-mile Chuckery Trail, but we did not venture on it. Captivated by Summit Metro Parks, we wanted to make one more stop before heading home. I’d seen pictures of an Overlook on Instagram but we weren’t sure where to look. Luckily, on our drive into Cuyahoga Falls looking for some dinner, we passed right by the parking lot for the Overlook Trail! The Overlook Trail is also located with the Cascade Valley Metro Park, but in a different area than the Signal Tree. The half-mile trail is paved and ADA compliant. We forgot to bring a stroller (#fail), but it’s not a hilly path and was easy enough for our tired kiddos. This is the perfect Instagram spot for fall foliage. I think we missed it by a week. If you’re looking for a very easy hike in Northeast Ohio, this is it! While we enjoyed a perfect combo of weather and scenery at Summit Metro Parks, my favorite part of our visit was the friendly Northeast Ohio personalities we walked by throughout the day. Nearly everyone said “hello” or spoke to us about our kids! I always feel like a hike in the woods connects me to our children and our Creator, but this day also encouraged me with the gleaming show of Midwestern hospitality. Have you been hiking in Northeast Ohio? Visited Summit Metro Parks? We still have so much more to explore!